"His House She Enters, There To Be A Light"
Don’t waste a curse on the universe –Remember it lived before you. One of the most valuable things I was taught at home was to accept that I would not always be able to figure out everything that happened in the world, or even in the Bible. I would not always get answers that satisfied my own whims, and Instead of wasting precious time wrestling over "questions and strifes of words," (Ist Timothy 6:4) and it was far better to focus on wholesome things. Life would always be part good and part bad and not everything would be fair and not everyone would be rich, but we could be rich in spirit if we filled our hearts from the good things around us. The news media keeps people in a constant state of tension, worrying about financial collapse. It is not the best fodder for women at home, who need to keep their moods on an even level, in order to be a light to their families. 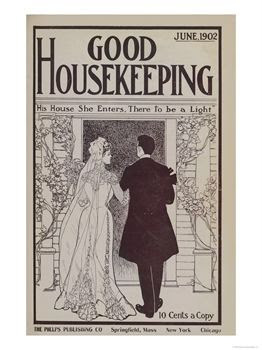 I love the Good Housekeeping slogan, above, that says "His house she enters, there to be a light." 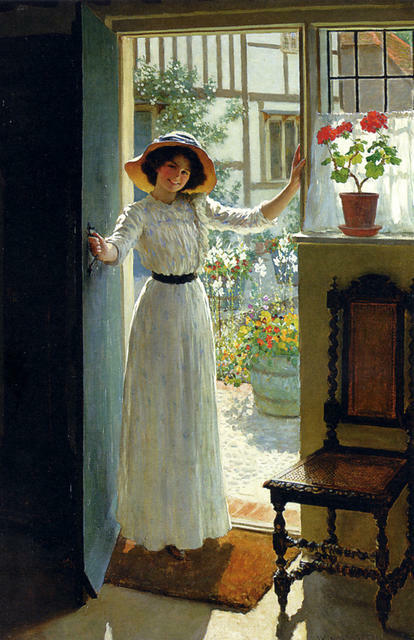 The woman at home is like a lighthouse. I explained about the purpose of a lighthouse in a post a few years ago. While the upper lights can be seen at a great distance, the lower lights send a beam across the waves so that those who are in distress can see where the shore is. If you want to know a little more about the lower lights, and the meaning of the song, "Let the Lower Lights be Burning," go here http://www.ussboston.org/shore.html . Scroll down past the song to find the story that inspired it. 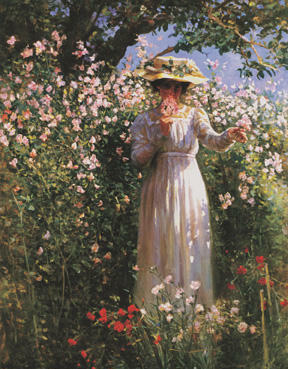 Now, while it is natural in this day and age to think that doing something important means to be noticed or have a prestigious career (the upper lights seen by all the world) the work that really matters, and that really saves lives, is done by the lower lights, which cast their beams along the shore to guide those who are seeking refuge. To take care of your own child and knit his soul to yours is more important than anything else. 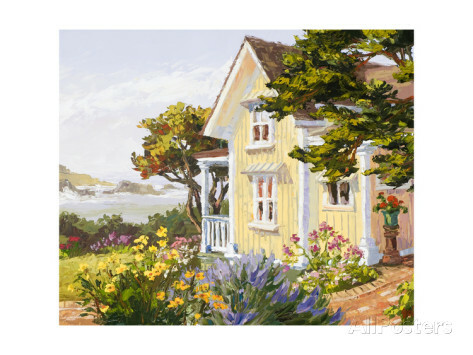 To keep house beautifully and look after a husband who is providing for his own, is better than any top-level position in the market place. There will always be news reports that show impending doom. The stock market is going to crash. The bankers want to be bailed out or the economy will collapse. (This was addressed in "Don't Bail Out the Bankers." Months later, as I said, the bankers showed their true greed and gave all their top CEOs some hefty raises and thousands of people still lost their houses) The price of gas will increase. The interest is going to be raised on housing. According to the news, the sky is falling! If you did not grow up knowing the story of Chicken-Little and Foxy-Loxy, please read it, here http://www.edsanders.com/chickenlittle/ This was a common childhood story that helped generations of children understand some things about living. As long as there is a news media, there will always be a scare-of-the-month, a disease-of-the-month (whatever happened to bird-flu? It was replaced by some kind of reptile threat), disaster of the day, new so-called vaccine of the month, and a new threat of the month. This enterprise thrives on this kind of fear. Jesus told about this sort of thing when He said that there shall be "wars and rumors of wars." (Matthew 24:6) He told us not to be troubled about these reports. As I have written quite a bit about the role the news media plays in influencing people to believe a certain way about things, I will not go into the history of the news media or all the details of why they constantly report impending financial collapse and nation-wide depression. I will, however, say that 40 years ago, the manner of speaking and reporting things was very different than it is today. While they did report disaster, there was not as much manipulation in it as there is today. For example, in order to get people to buy something or to rush to get the latest drug, or to protest something, they often report a story in such a way as to compel them to just what they are hoping they will do. The news is often created and marketed by just a few major organizations . A select few people pick and choose what will be reported every day. It is not news zapped to them by God. It is news that they pick to report that will serve their best interests. They will ignore a lot of news (such as Christians being killed in Africa) and hype up other news. I explained this all in an article called "How to Stop Worrying About Politics and Get On With Your Life." One time many years ago I attended a ladies Bible class, where a lot of the older women spent a great deal of the study time relating events about their latest surgeries. They described every detail of the medical procedures and told of every pain they had. I had taken a visitor with me one day and she sat through the entire thing in silence. The actual Bible study was hard to concentrate on after hearing so much of this, and afterwards she asked me, "How can you listen to so much bad news?" I guess they had all become so used to hearing it, that they had not realized how unwholesome it was. Weeks later when I invited her to come again, she answered, "I will, if it is not another 'organ recital'". It is my observation that the media network news is worse than most programming and more blatant than some of the ads. I have had to turn off the radio in my car when transporting children, because of the unwholesome words on the news. For some reason, people think it is a command of God, or something, to listen to this daily. Would you let a person--a real person-- come in to your house at dinner time and fill up the time telling you bad news? We wonder why we get so anxious, but what we are listening to daily can be a source of it. The news media helps shape society. They are movers and shakers. They spread their word and people change. One example is the news reports of the early 70's when I first married. Every time I heard it, they were saying that women could no longer stay home. They would say that a husband's income was not adequate to support a family. Husbands were coming home and telling their wives that they could no longer live on one income. Yet all through that time, there were many women who stayed with the home. Their economy did not collapse. I wrote about this on "Do What God Says Do, and Let Him Take Care of the Rest." 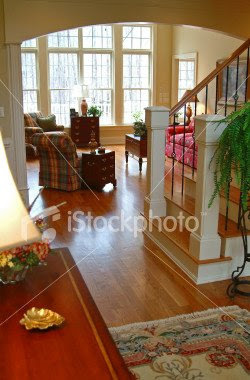 I said in this article that you control your own economy of the home. When considering impending economical doom, I always think of the women at home in the Depression Era. It would not have made sense for them to leave their homes to seek jobs, as there were no jobs for the men, or the women, in many areas of this country. 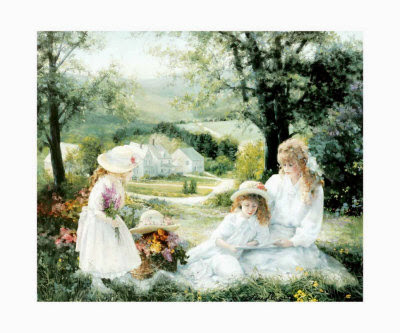 Yet today there are people living who still relate stories of their mothers love and home life during that time. 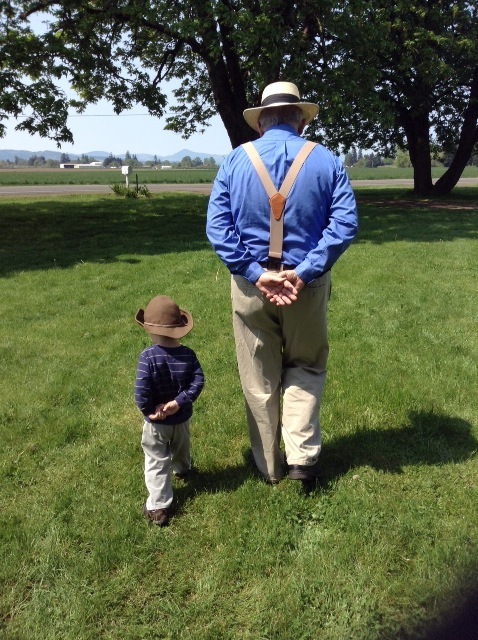 I have posted several times about the stories you will one day tell your grandchildren. 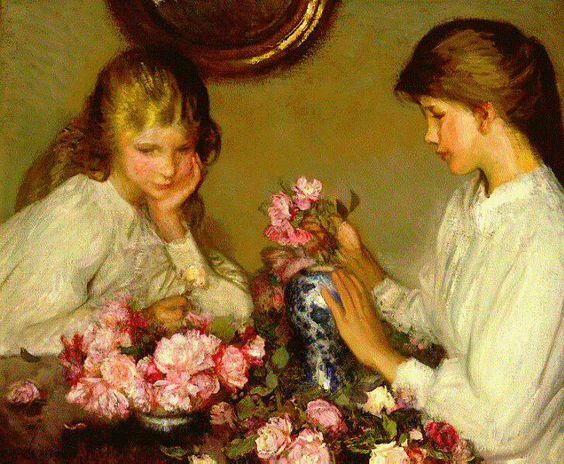 Will this generation of young women have good stories to tell, or will they jump ship and go out to the workplace, leaving their children and homes in the care of others? Are they strong enough to withstand a depression and keep their families together? If there is a news report about the economy that troubles you, does it mean you should abandon your home and go out to bring in money? We have lived through these news reports for decades, and what it comes down to is this: staying home is based partly on a belief that you should be there. That belief will carry you through "wars and rumors of wars." To some, staying home is merely an "option" or a preference. Preferences and options can change with the circumstances, but beliefs do not. Beliefs find ways around obstacles, but preferences are like fair weather friends: they do not stay the same. I hope this in some way helps the several requests for a post about how to approach the constant reports of impending disaster. If there is such financial crisis, I do not want to be parted from my family. I want to be with them. Today, it is quite costly to go to work, with the expenses it entails, but the highest price is the price you will pay later on with your children. I certainly would never risk that. Money is not more important than being with your children. Even those who have no children are finding out that a job is not really worth the stress on their lives, and that they can fulfill all their talents and develop new skills much better at home. They can be much better helpers to their husbands if they are home based. To test out what kind effect listening to so much bad news has on you, how about having a media blackout in your home. Every time you get the urge to listen to some, just read the Bible. When you read the Bible, read it like you would a news report. That's the Good News. We are not supposed to be dwelling on the bad news. You might not see a particular effect taking place at first, but one thing you will observe for sure: even without the news, life goes on. You can still function without it. You still have to do the things you have to do. With or without the news, you will be dedicated to your loved ones, and you can give them much more love if your mind is not clouded with the doom and gloom of the media. You will not be isolated, nor will you miss out on anything of major importance. If there is something that you need to know, there will be no way to avoid knowing it, for someone will call you on the phone and tell you, or you will merely walk past the newspaper at the grocery store and see the headlines, or turn on your computer and see the first line of the latest disaster on your home page. It is good to know of things you can do something about, but to have constant mental diet of things that you have no control over, can be debilitating to your purpose at home. 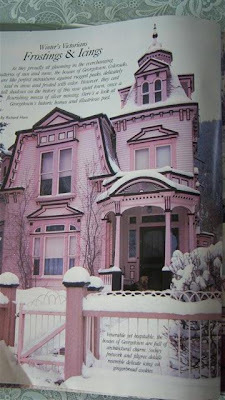 The first year of "Victoria" consisted of issues in winter and summer. Here are photographs from the first winter issue that I found interesting. 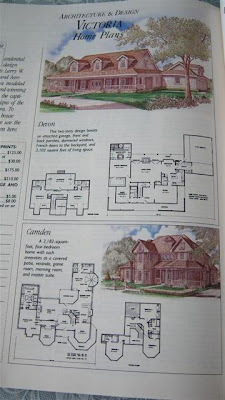 The house plans were always a fascination to my children, who poured over them and observed every little thing. From there, they began drawing their own floor plans on graph paper. 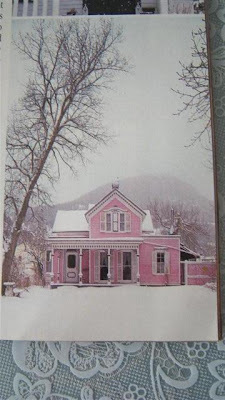 They became familiar with terms like "cupola," "gable," "turret," "dormer," "wrap around porch" and many others, just from this section of the magazine when it came. 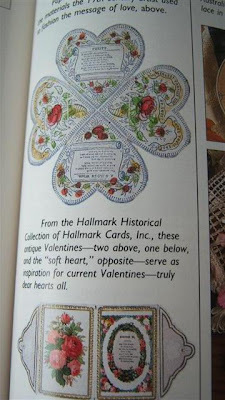 This was a page that showed an antique Valentine, which I think caused a revival in old-fashioned Valentine -making. The above was a table set for a Christmas wedding reception. Above: Toasted seven-grain bread with orange honey and vanilla milk tea. 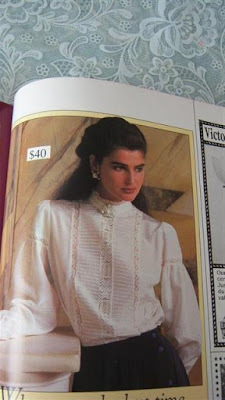 An ad for a blouse you could order from Victoria magazine. No, this is not my house! It is a floor I like. It is good to see people are wising up and not installing expensive wall to wall carpet, opting for floors that can be more easily cleaned. The old ways are sometimes better, with the little scatter rugs that can be washed and line dried. 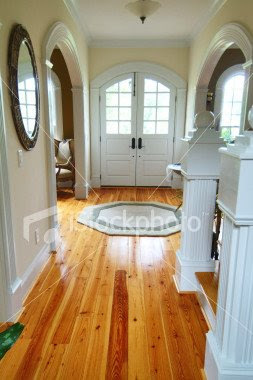 My son is collecting a box at a time from the hardware store, of this flooring, (he picked a cherry wood color, which is darker) and he hopes to replace the dirty carpet with this in the front door area. After the kitchen disaster, I realize it is a lot of pain before you see the gain. I used the dishwasher for the first time and also cluttered up the surface of the new kitchen top. I still have a lot of bags to unload and am very disorganized but the new faucet is so wonderful I can forget the mess around here. The homeowner's insurance does pay for a lot of this. Had we known, or even suspected, we would have applied when the leak first occurred. 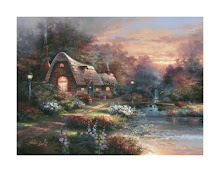 Also, if anyone would feel inclined to answer an anonynmous commenter here http://homeliving.blogspot.com/2009/01/homemaking-without-worry.html I would appreciate it. I can stay in touch with the computer but havent time to post a thoughtful reply. She has missed the point of the article. It was NOT about how many children a woman should have, nor was it about whether or not a woman should work outside the home. The article was about reducing the amount of arguing and stress that comes about when people begin to talk about your belief about being home. I merely suggested that it was not wise to complain about financial stress to people who were not in the same program, not on board with you, not on your side, etc. and to be wise about confiding in some people until you figure out where they stand. Not everyone is mature. Not everyone will have studied out the Bible and not everyone will understand history or have an understanding of the real reasons women need to be home. I did not intend to go off on a tangent about whether a woman should have a clean house or not. It was about talking too much and revealing too much information to people who would engage in debate.It applies to anything, not just to women at home. Also I included a link to an MSN article which appeared a day later after my own article, which the poster could read perhaps and then apply the principles I was trying to point out. The article was about limiting the focus on yourself and your problems and focusing more on uplifting things that would not bring you down. If you will notice, her comments are sidetracking from the original article and issue I was addressing, something that young feminists have a habit of doing. New kitchen photos coming some day, we hope. 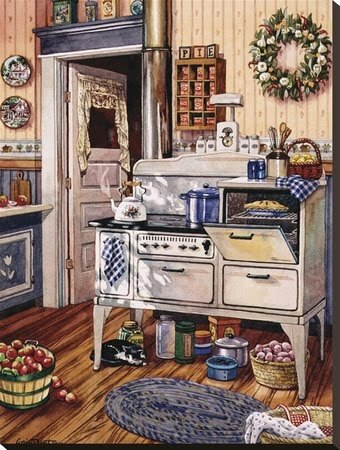 Right now we are cooking and washing dishes in our kitchen and it is really a mess so it will be awhile before we can show a completed kitchen. There is still soem woodwork to be put up to hide some areas, and some flooring to be replaced. Also, we kept the top cabinets and they need repainting. Hope to come back here soon and post something meaningful! 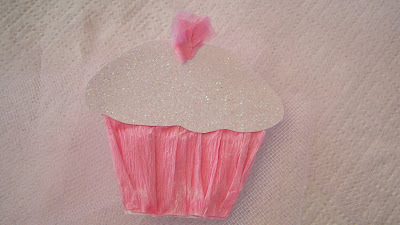 Cupcake card made with pleated crepe paper streamer on the base. Click on for detailed view. One of my hostesses in Alaska gave me this fuel box from the 1950's. We used these in the early days of homesteading, for the upper cabinets. Women would take calico flour sacking and make curtains for them. Thanks to Carol for this wonderful gift! 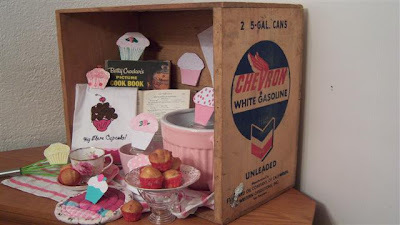 I am going to make a cupboard with it, but for now, it makes a nice display box for my cupcakes. These look yummy but they are only made of heavy art papers. Some of the tops are cut out of glitter paper (available at Wal-Mart in a stack). 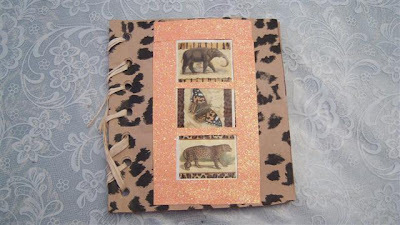 Others are hole-punched in glitter paper, and others are swirled with polymark or scribbles paint and glitter glue. The lower two cards are tags on which are placed pieces of real cupcake liners. I've included patterns so you can mix and match as you like. B e sure to always glue the lower part before adding the upper part, because it overhangs a little. 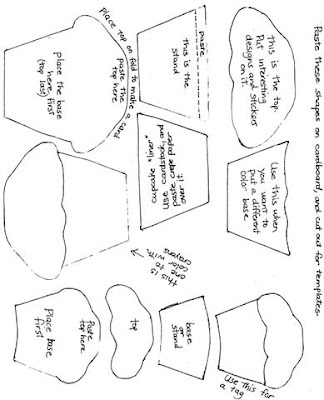 Right-click on the drawing, below and then "print" for your patterns. 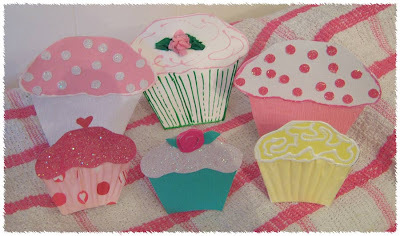 Cut them out on card stock and trace around them to make cards, tags and stand up paper cupcakes. Remember when husbands called their wives "Cupcake?" I had a chuckle at a You-Tube video series with Cary Grant, called "The Dream Wife. " There were 5 or 6 episodes about a man who wanted a wife to come home to, who would cook meals and look after the children. He was engaged to a woman who was absorbed in her career. When he spoke to her about this, she said, "Don't you remember that women have been liberated? Haven't you ever heard of Susan B. Anthony?" He gave her startled look and then said, "Is she a good cook?" 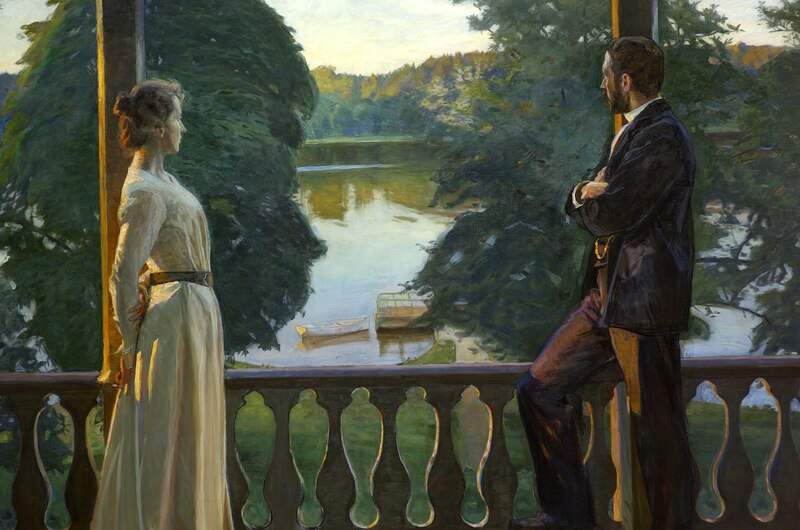 Later on he decides he does not want to marry this career woman and finds a foreign girl who has old fashioned ideas, but her father was not in favor of the match. He said, "American women do not want to be mothers. They want to be fathers. I do not want my daughter to be a father!" It might be smart to view these videos before they are completely banned! 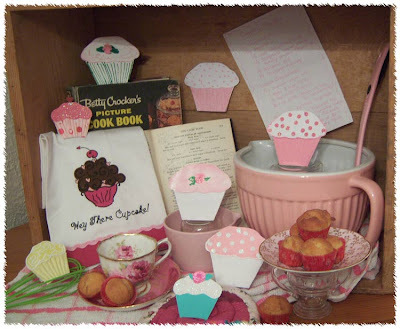 Prepare a 24-count mini-cupcake pan by putting mini cup-cake liners in it. Preheat oven to 350 F. While oven is heating, mix the batter. 3/4 cup whole milk or half-and-half (if you do not eat dairy, use water) Use more or less, for consistency. Add the dry mix to the liquids and mix well, until batter is smooth. With small spoon, fill cupcake liners about three-fourths full. There will be enough batter for half a pan more, depending on how full you fill the liners. For topping, just mix a little cream cheese with honey, or dust with cinnamon. 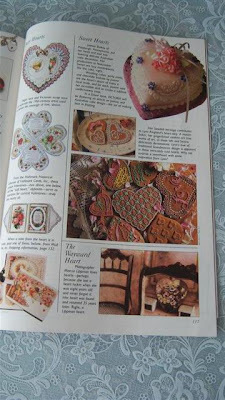 These are hearts with a special glittered edge that looks like tinsel or rick-rack. It is a more advanced paper project, but there is an easy one at the end. I used to think that all children were taught the making of a heart and a snowflake, ( our mothers always showed us how to do this ) until I began meeting older children and teens who did not know how to do it, so included is a little demonstraton on how to make hearts. 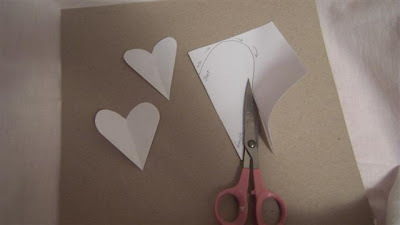 Draw half heart shapes on the folds of used paper, junk mail, construction paper, etc. for your patterns. Make several of them, open them up, and pick the ones you like the best for your pattern. You can stop, at this point, and just cut out colored hearts from construction paper, and use them for cards or decorations. 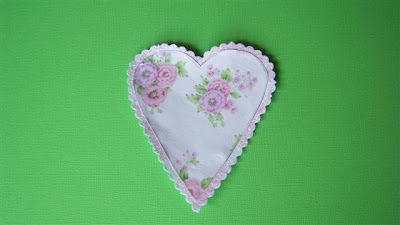 We have used different sized pink and white hearts, made by children, to scatter on luncheon tables, as "confetti," with a little glitter on each heart. Pick the best ones for your templates. Practice making them until you arrive at a shape you can use. Draw them from the fold outward and down to the tip again. Click on for a larger view. 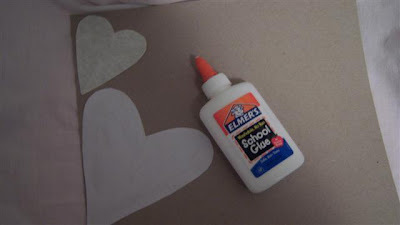 Cut them out and glue them down on cardboard from cereal boxes or the cardboard from calendars, for your templates. Card stock is not as sturdy or enduring, for templates. 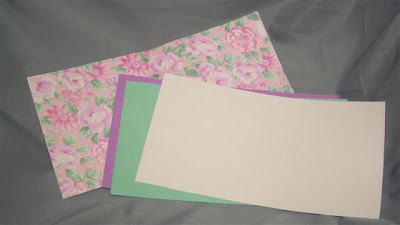 Now, place these templates on heavy card stock or fancy papers, in position so that there is plenty of space around them to cut outside of the line. Index cards are good for card stock, if you have them. They also come in many different colors and are great for small projects, where you do not want to use a full sheet of paper. With deckle edge scissors, cut outside of the line, leaving some space for the glitter. Regular scissors will work just fine, also. One in the picture at the end, was made with straight scissors. 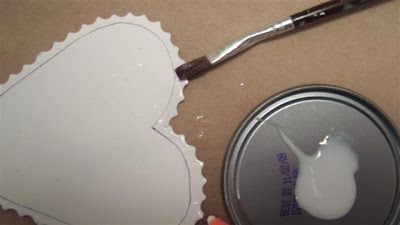 Pour out some white glue on a lid and paint the edges , up to the drawn line, with a flat edge paintbrush . A child's watercolor brush will not work as well, with this project. Shake glitter color of your choice over the serrated edges of the card, and collect it into a dish. 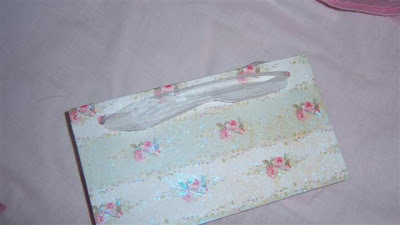 Another method is to pour a lot of glitter into a container and dip the wet edges of the card into the glitter. 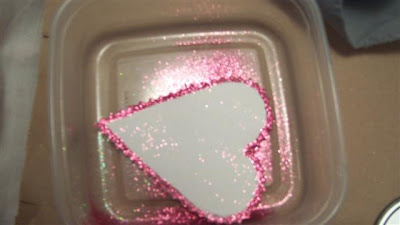 Pour excess glitter back into the container, or put a lid on it and keep it to use again. Glitter is messy, so I do all my tracing, cutting, gluing and glittering inside of a very large, flat box. 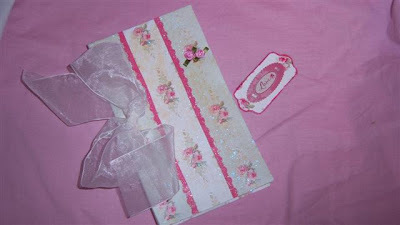 Samples of the glittered edge technique: The ruffled edge in the upper middle is made by sandwiched the crepe paper streamer, pleated, between two card stock hearts. The lower right hearts were made, with help, by a two year old girl. 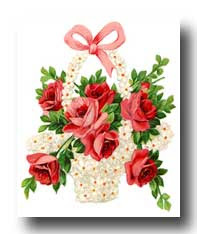 The heart shaped card is painted with white glue, then filled with cut squares of tissue paper, scrunched with her baby fingers, made to look like roses. 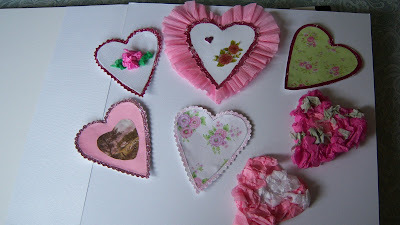 Click on for a larger view of the others: the one on the far left is topped with another heart after it the edge was glittered, and the one in the middle topped with another cut out heart in scrapbook paper. 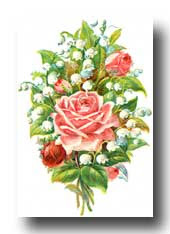 Another "scrunchy tissue rose" is placed in the middle of the one on the upper left. This is the one made from the flat, narrow glove box, shown below. Be sure to click it for a larger view. I actually think I like the paper without the glaze, but the glaze makes the book cover more durable. This is one for boys, made with a gift bag saved from long ago. He chose the stickers for it, and I outlined the stickers with strips of glitter paper. It is tied with straw rafia through punched holes. Save yourself this trouble and just make two holes or staple it. Paper bag material is hard to punch. 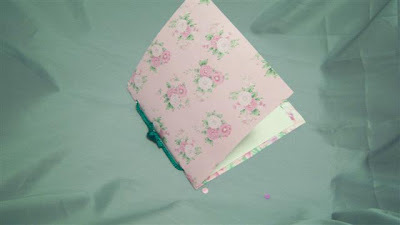 The inside pages are made with plain paper bag material. Inside, there will be a little folded piece from the paper bag. Put two pages on one side of it and two pages on the other side. Click on for a larger view. 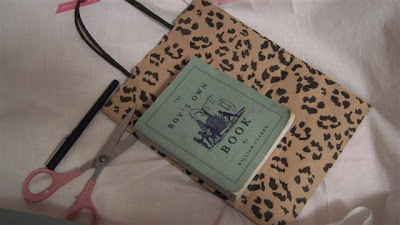 Outline a book on the folded edge of the bag, and cut it out. Four boys books. 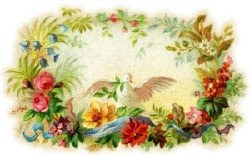 Click on for a larger view.Two on the upper left are made from a used calendar picture, cut in half, folded, and tied with string to look like fisherman's net string. 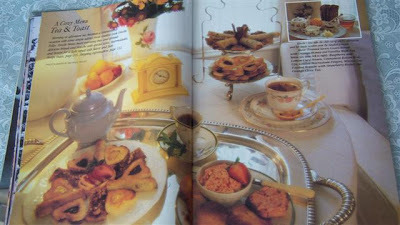 The lower one is covered with the side of the Yorkshire Gold tea box, with a scene of a cricket game in the background. 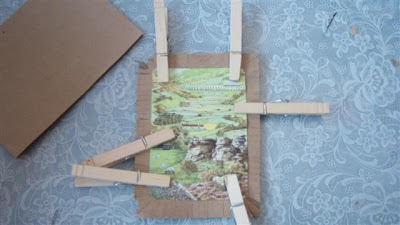 It is glued onto another piece of brown paper bag and the edges are clipped for a fringe. The book is made of brown paper bag and tied with a gold shoelace. This is how I anchor all the pasted pieces to make them stick. Make holes equal distance by punching from the ends as far as the puncher will go. Put your filler papers inside and punch through the hole, to make them fit. Here is my latest box from a pair of pink rubber gloves. I liked this box because it had a very narrow spine, which means it will not take very many pieces of paper to fill it up. The box is cut open on the side, and the other narrow piece discarded. 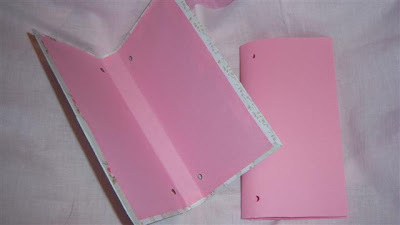 The holes are punched on the front of the cover, this time, instead of on the spine. 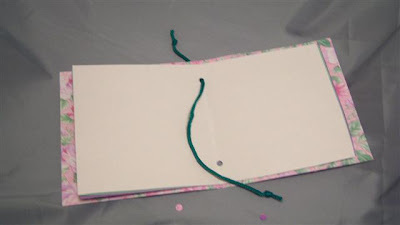 Several sheets of paper are folded in half, cut to size (slightly smaller than the cover) , then folded in half and holes punched just like the cover. 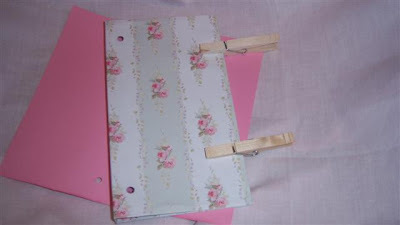 Hold the edges of the book down, by placing clothespins on it for several hours after you have finished the book, to keep the covers from falling open. 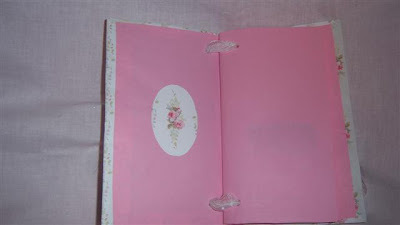 After threading the ribbon or string from the back cover, through the pages, to the front cover, open the book up as far as it will go and give the ribbon some space. 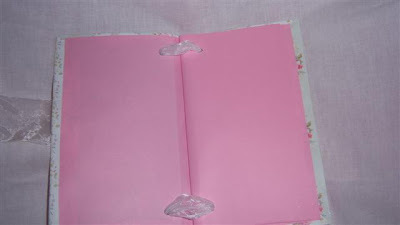 Do not tie the front until you have done this, or the pages will not turn properly. Here is what the ribbon looks like threaded through the back cover. 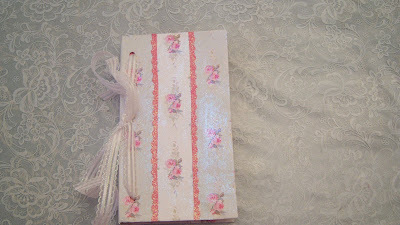 This is covered with a paper from the Carol Wilson designs. 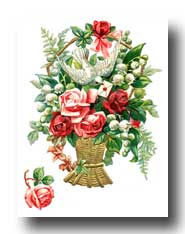 Carol Wilson is the one that publishes all those lovely raised-embossed cards and stationery. Cut the paper a little larger than the book. Fold the paper around the folded book jacket, rather than pasting it on flat. It makes it have a little more "give" when opening and closing the book. Everyone has to tinker with their project to find out how it works for them. 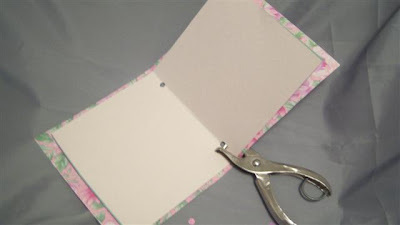 Then fold some edges of the paper over to the inside. 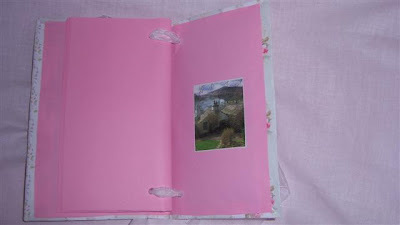 Here are added end-papers in the same color as the pages, with an oval piece glued on, to give it a finished look. The back inside cover with a clipping from a magazine. Since I do not know what will be done with this book, its pages are blank. 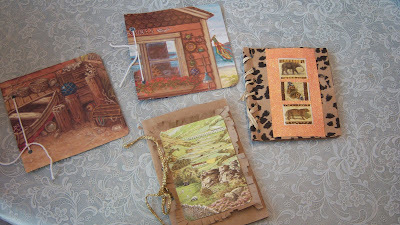 Used calendars, themed gift wrap, or special scrapbook pages, make nice covers for books for boys. The papers are nice on their own, so I didn't want to put to many embellishments on it. I did glaze over the cover with craft glitter paint. 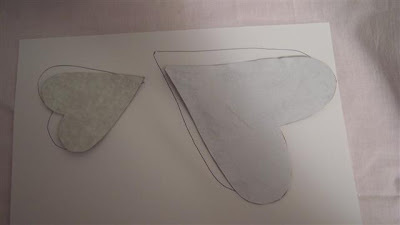 Two strips from glitter paper were added by cutting with shaped scissors. 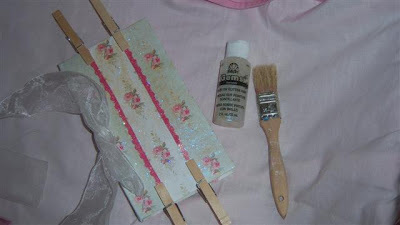 All gluing and folding is held together during this project, with clothespins until it dries.When gluing or adding paint or glaze or glitter glue to any paper/cardboard project, it will look wrinkled, but as it dries, it settles down nice and flat. Two ribbon roses are placed over two roses ont he paper and glued down. 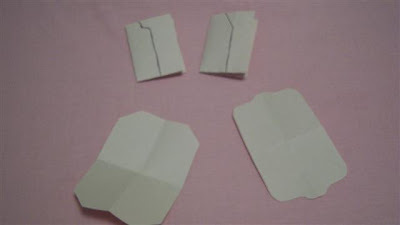 A gift tag is made with a small scrap of the paper. The ribbon is finally tied on the outside. I prefer wired ribbons because they stay in the shape in which they are placed. This is just another example of something that can be done with a box that usually ends up in the trash. These are what I called "homestead crafts" because they were similar to things we did in homestead days. It is a way of providing a creative project for children by looking around and seeing what you have. 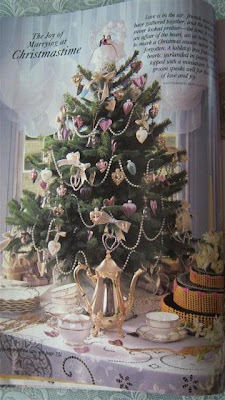 In those days, all we had was tinfoil, catalog pages, boxes, home made paste, string, pieces of fabric, plain scissors, wax paper and maybe a few other things, but we used our imagination and were able to do quite a bit. If I have your link on the side, and it is no longer available, or if it is the wrong address, please post. Today I might get around to fixing them. http://share.shutterfly.com/share/received/album.sfly?sid=1AbsWzNo3cMXRQ&startIndex=0&fid=97e58ddd7f1cea74 there are over 200 pictures of this home. It is always refreshing to look at a clean room, when I am in the middle of a messy one. While waiting for the electrician and the other things, these pictures have given me some ideas. Since there are sometimes objections from friends regarding a woman's desire to be a full time home maker, I thought I would address one way to deal with it. There are many things that can be done to calm the concerns of onlookers and outsiders, and even insiders, but I will address just one of them now. If a woman could trace how the conversations with friends and relatives seem so often to focus on their objections to her staying home, she could possibly solve most of the problem. 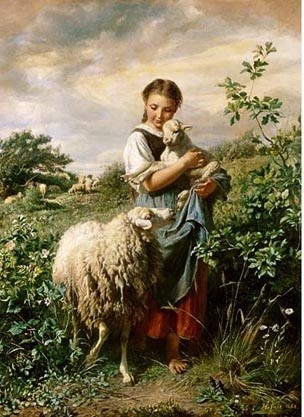 If she would rehearse in her memory the last exchange she had with people who are urging her to leave home and join the herd in the workplace, she might be able to see how to prevent people focusing on this and bringing worry and stress into her life. One thing that almost always puts a stop to the pressure from other folks is to avoid anything that can be perceived as complaining or expressing a feeling of being deprived of anything. Do not say things like, "I was grocery shopping today and I did not buy the _________because I could not afford it." Automatically, some people's solutions will be "You should get a job." Instead, say, I decided I wanted a different menu." Do not say "It is hard when you only have one income." 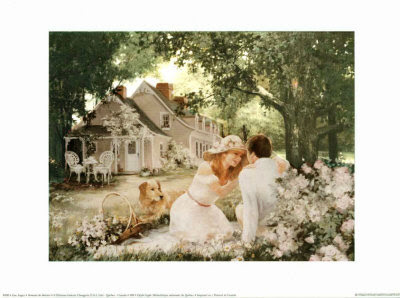 Who said you should have two incomes, and where is it written that the wife should work outside the home? Instead say, "I am enjoying learning how to look after our income and shop more wisely." Develop a habit of always portraying things in a good light. Give a good report about your stay-at-home status. Avoid saying things about being alone all day or having no money to go out, or only having one car, even if it is not a complaint, because "they" will take it that way. 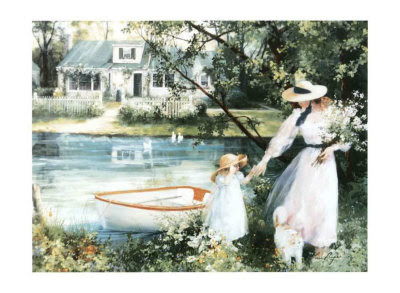 "They" may be tuned in to any little thing you say that makes homemaking seem disadvantageous to you. Put a different spin on the entire thing. Say things like, "I really don't miss paying for tags, insurance, repairs, and licences for two vehicles. I do not think I ever want to go back to those days." You could also say, "I appreciate having the time to really concentrate on taking care of things for my husband. If you do have a car, you can cite the many times he has called and you were able to do something for him that he needed done while at work: the banking, paying bills, getting clothes ready for the next day, and so forth. If "they" seem to want to dwell on the subject of your staying home vs. going to work each and every time they visit with you, one of my own tactics for dealing with telemarketers might work: "You called me two days ago and if you remember, we discussed this, and it was decided that I was not going to buy this product, and furthermore, we determined that it would not be necessary for you to call me about this again. I will let you know if I change my mind. " There are two ways of dealing with the persistent people who feel obligated to tell you that you will be better off to get a job. One way is to tolerate it, and another way is to exercise patience. Tolerance is not the same as patience. When someone continually brings up a subject and you put up with it, ignore it, and try to be polite, hoping that they will come to a better understanding on their own, you are tolerating it. Toleration does not benefit them very much and it does not help you show a good example to them. One way to understand this is in bringing up children. If you tolerate a behavior, it goes uncorrected. Toleration is an attempt to ease the discomfort on your part and avoid further disruption on their part. However, this does not actually work as effectively as patience does. Patience is a more Biblical and sensible approach to handling people who want to discuss a matter that will unsettle you. Patience is a consistency of action with the goal of achieving a result. 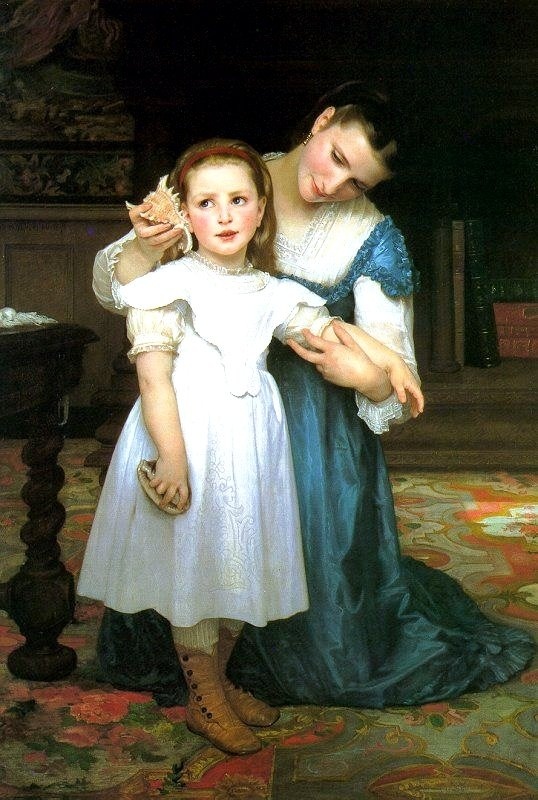 Patience with children means that when you are teaching them to look after themselves, you say the same thing, firmly, each time, and then show them how to do it. You will remind them when they forget, knowing that one day the training will take hold, and they will remember. When you patiently strive forward to make progress with your home and your life each day, others will see it and eventually keep quiet about their opinion of you. When you remind them that you have had this conversation with them before, and you reached the conclusion that it was the right season for you to stay home, they will be less likely to pursue it. Another issue that people seem to want you to deal with is one of personal fulfillment. "They" worry that you are depriving yourself of some advancement in education or career. They will remind you that you are getting further behind and will not be able to catch up when you decide to go to work. This is not proven, as so many industries and needs change each year, that it is probable that the kind of employment available today will not even exist tomorrow. If you do not want to get involved in this conversation, first assure them that you are personally fulfilled and happy to help your husband by looking after him. List the number of things you do for him each day and show how much stress and time and money it saves him. Then, learn to change the subject onto something greater than yourself and your own activities. Make a list of the great variety of things there are to talk about and learn to change the conversation by taking something in a remark and using it as a vehicle to another conversation. For example, if someone says that you are just vegetating at home, say "Speaking of vegetables, do you know where I can find a good bargain on broccoli?" If someone says you need to bring in an extra income to "help" your husband, say, "That reminds me: I am looking for some traffic to my Etsy shop, where I am getting a little extra income. I'll email you the address and maybe you can show your friends," or "I'm trying to look after our income so that there is not so much going out, and would welcome any coupons you could give me." These are just two examples of how to take a word out of a sentence and turn it into another subject. It should be used only when the subject matter is focusing too much on you, and causing inner turmoil. Knowing how to use it can save you a lot of problems. 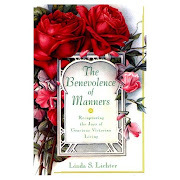 With the world the way it is today, it may take some people years to finally come to the conclusion that you are trying to do things in a more natural way, and that you are a homemaker because of your beliefs. If you really have a strong conviction about being home, other people's remarks, though disturbing, will not be intimidating enough to make you give it all up and join the hunt with the men. For the most part, though, your attitude is what will determine whether other people consistently focus on the subject, or not. Guarding your words and choosing the right things to say to lead people's minds in the right direction, goes a long way to preventing people from taking up a subject and running with it. Having a blog that shows what you are doing -- it gives people a chance to see how important this is to you. Include lots of other homemaking links for your doubters to look up. Having a tea for the ones who just dont get it. They will remember it as one of the nicest times they ever had. Engage in a work that is important to you, from crochet to crafting to whatever you like., so that you will have something to show for any spare time you can get. Give your hand work as gifts. Eventually people will come back and say, "Could you make one of those for my (aunt, sister, etc)? I will give you the money for materials." Very few women at work have time to do the things they really would like to do, and they will be glad to know someone who is available to do some of these things. This is a typical reaction of people who at first could not understand why women stay home. Eventually, if you are patient, they will understand. Patience means to keep on the road you are going and not divert from it. It means you are teaching a lesson as you go. This was mainly written to young people to caution them not to reveal or "tell all" to people when it is none of their business. I used to have a sticky-beak come around my house regularly and inquire about every little thing. "Are you really happy?" "Do you get tired?" "Does your husband let you have a checkbook?" "Why is that one bedroom all messed up?" "Can't you get a job?" She had the knack of figuring out whether I was dealing with a leak in the roof or a squeaky door, or maybe had been on a trip and had a mountain of laundry, and would always say, "If you had a job, you could have someone come in and fix that!" It is best not to confide in people like this. Learn who is your friend and who will give you the best counsel. If you get tired of the pressure from others, to leave your home and go to work, then eliminate the problem by being careful what you talk about. The woman who came often to give me advice, no longer even has a home. 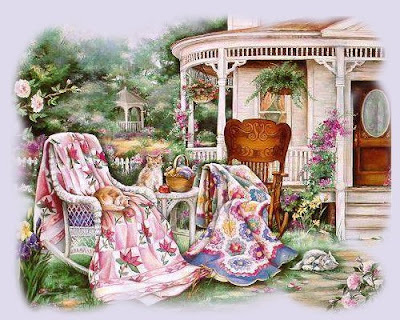 She did not like housework, and did not like sewing or cooking or knitting, but thought since she did not like it, no one else would like it either. She did not enjoy being a homemaker, and thought it was punishment for others to have to be homemakers. These kinds of beliefs make it bad for them to be advisors, and that is why I say it is good if you surround yourself with the kind of talk that will reinforce your decision to be at home. Eventually you become stronger and able to deal with objections. It is the same as growing up: we do not expose babies to every thing, until they are strong enough to deal with it. Life is a process of maturing and growing up, and there is a time and season for everything. 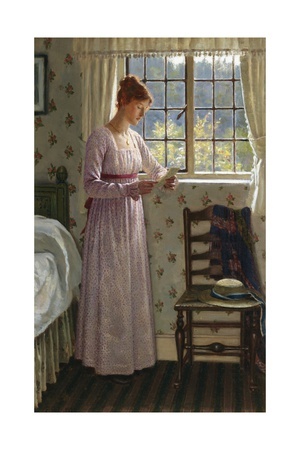 I think young women should be left to really enjoy their homes and get into cooking and sewing or knitting, or whatever they love and are absorbed with, without too much turmoil. That is why I suggested, in this post, (which was a requested subject), that they eliminate most of the conflict by being careful what they say which will bring more arguing into their lives. I've shown a couple of ways to do it. Everyone of course, can do as they like, and I'm not establishing policy here, just some ideas to work with. If a woman has lots of friends and loves telling them everything, and does not mind if they offer objections or run her down for staying home, then she should not change her conversation habits. I just want to add one example of how to say the wrong thing that will cause more trouble in your life, from real life experience. My father in law was an evangelist and preacher. He was 94 when he died, and he had no refinement about what to say, which was actually quite good in some cases, but in others, it was not. One time a woman called him and asked him to visit her husband in prison. He was not a Christian, and she had become a Christian quite a few years after she married him. He was in prison because he had stabbed someone with a knife. When my father in law visited him, he asked him, "What kind of knife did you use?" Of course, he did not get a kind response, from the man who wasn't too interested in talking with a preacher in the first place. He had introduced a sore subject. We have to learn to avoid sore subjects at certain times and learn who we can talk to about certain things. I am commenting on this because of some misunderstanding that I apparently am advising people to lie, or something. I'm not doing that at all. Just because you don't confess every little thing to all your friends and relatives, does not mean you are lying or hiding something. It is a matter of preserving personal dignity and privacy. It is a matter of guarding the tongue and capturing the thoughts before they roll off the tongue, because they are not appropriate and will set off a reaction in the other person. When girls are young, this needs to be taught, because although we have nothing to hide, we are careful what we say to people who will argue back with us....unless of course, you want to spend the time responding to them. It is up to the individual, but even those women who have to work outside the home, are given advice about innappropriate things to talk about in the workplace. Would this advice about not talking about their latest illness or their financial condition (debt, purchases, etc) be called "lying?" Would it be called "trying to make things look good when they are not?" No, it is termed "Too Much Information." In the old days, there were certain subjects that were considered personal, and we did not ask about them. No one knew how much a woman weighed, how much money her husband made, how much they spent, or what they had written in a personal letter. No one asked how old you were unless you were a little child. People did not talk about every thing they did or were doing. They knew that sometimes it could cause a worse problem. I doubt that anyone would think that not talking about personal things at work would be dishonest or lying, yet today there is a column online that suggests there are 13 subjects that should not be discussed at work, if you are new at the job. I am only saying here that if you are new at full time homemaking, there are some things that you would be better off not discussing until you get more established, and more confident. 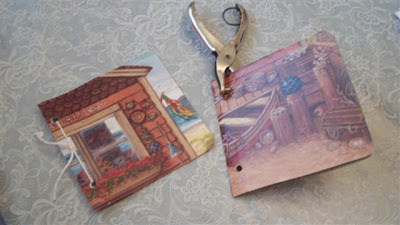 Print free clip art like this from Karen's Whimsy online, and cut them out to paste on hand made tags. 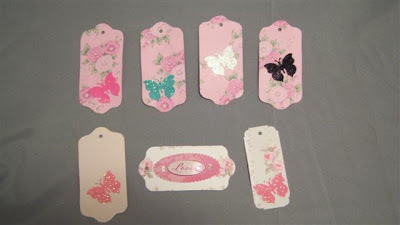 Making tags is a good way to use up those last small pieces of precious paper, and they are an enjoyable activity for children that require only scissors, paste and paper. 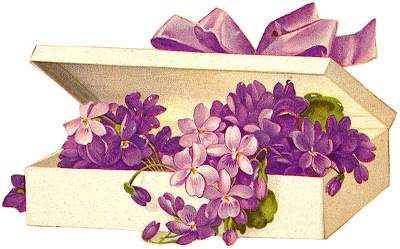 To get clip art easily, just clip any art you see from papers, wrappers, food boxes, cartons, magazines and catalogs. Tags have become a very interesting art form these days. Some tags date back to the arts and crafts of the Victorian era, and are quite valuable. 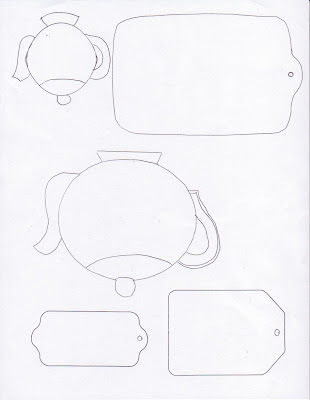 These are patterns for tag templates. Since they are drawn free-hand, they will not be accurate. 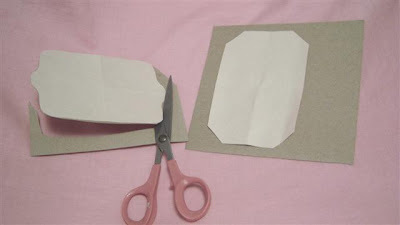 To make your patterns accurate and even on both sides, just fold paper in half and cut, as shown below. 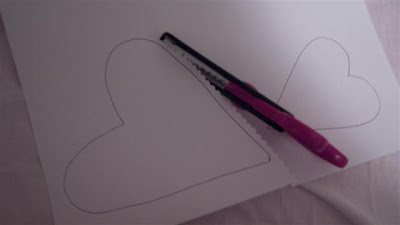 To make your own pattern, fold paper in half twice, and then draw an outline starting at one of the open edges. I use construction paper for these things because it is not expensive and I can afford to make a mistake. Children should be taught how to use paper economically, by cutting what they need from the outer edges, not from the middle. Unfold the paper and you will see the tag you made. Use your own ideas for shapes. Paste the shapes you made on cardboard from any kind of box in your food pantry. Cut out the shapes again. 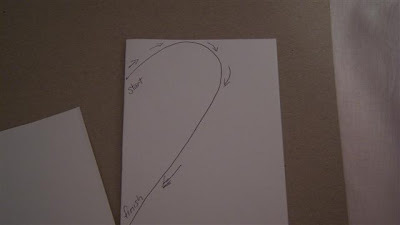 This gives a sturdy template to trace around on paper for tags. Here are some ideas for tags. 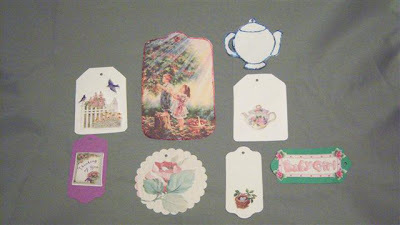 The larger tag in the middle is made by placing the cardboard template on a greeting card from the dollar store. The others are made by putting a sticker on each one. The round tag in the middle is made from a four-inch round hole punch. More ideas for tags. The butterflies are made by using a special butterfly punch with glitter paper from a glitter stack. 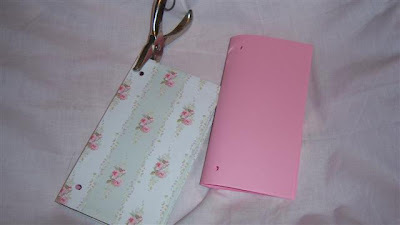 Scraps from patterned paper and construction paper are used as tags. 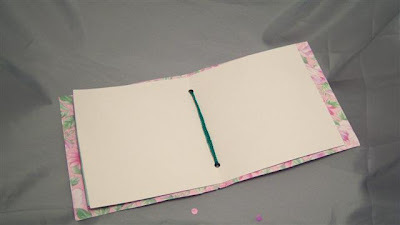 To make a very easy book, select some construction paper for the pages, and one special piece of scrapbook paper for the cover. Fold it all in half to find the middle. Center the filler paper in the cover, and put the hole punch as far as it will go at each end. Thread any kind of rope or ribbon through it to bind it. This is a shoelace-like rope from a used gift bag. This is what the middle looks like when you tie the ribbon through it. For children, make the book small enough to fill it easily with a story or pictures or a lesson. 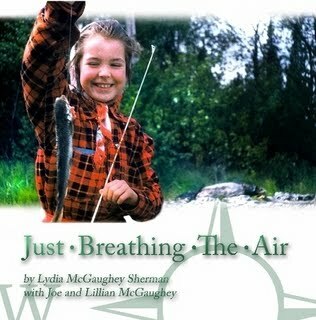 The outer cover of the book.